I never did figure out your gender...nor did you get an official name outside of "hey! 兔子!" and "my baby~" but I'm going to miss you. I keep looking over at your cage expecting you to poke your head out of your little log cabin only to be reminded that you'll never do that again. I keep walking over to your cage expecting you to hop around and cling to the bars, spazzing over treats, only to be reminded that you won't be doing that anymore. I boomed music on my computer all day long trying not to think that you're gone, because whenever I do I start crying. Now I just have a gigantic 3-story cage to clean up that I can't even look at because tears blur my eyes whenever I do. I hope your stay with me was a happy one, and I hope wherever you are now you're comfortable and happy too. You were a complete impulse buy that one summer day but you brought me a lot of laughs (and early morning wake-up calls) and I love you a lot sweetie. Bye-bye, I'm going to miss you! 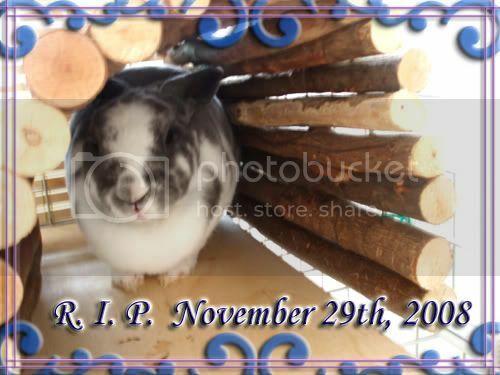 I'm sure s/he's enjoying himself in bunny heaven right now. Hope you'll be able to move on from this soon. You don't know me other than one of two conversations on msn and I am very sorry to hear your beloved bunny has passed away. For some losing fur-babies is harder than losing people and having experienced that loss several times now in my life I completely understand. In terms of cremation... I know the Gatineau/Hull SPCA provides it so I am assuming you can check with your local SPCA about that. Something you can do seeing as you are so crafty is make something like a pillow, bunny ears... something as a memorial to him. I know I am planning to do that for my cat Wire but I just haven't been able to decide on what to do. *snugs* I wish you the best, and hope to see you on the 5th.